Not all attempts at breeding strawberry seeds are successful. Therefore, for this method its fame as a time-consuming and ungrateful. Yes, the seeds in the berry is very small and care for the seedlings difficult. But half of success in growing strawberries depends on the proper selection of seeds. To select the seed best to go to a specialty store. Today, many firms sell strawberry seeds in the mail. But, when making the order so you risk getting a poor quality product. It can be with expired shelf life, the bags can be damaged during shipment. And the advice of a sales professional who works in a specialty store, not hurt. A good salesman will not only help you to make the grade, but will also give specific recommendations for care and cultivation. Choosing strawberry seeds, don't get greedy. Do not try to purchase the largest variety with huge berries. Large-fruited varieties are the most capricious and demanding to care for. Besides, they have large seeds, and in the bag there will be only a few pieces, not more than a dozen, whereas a small more than 30. There is a greater chance that even if the germination is not very good (100% germination from seed it never happens, but it can be 30%, and 80), strawberry seedlings, you will still get enough to land the number. Strawberry varieties with small berries compensate for the small size a wonderful aroma and taste. They tend to be more productive and require careful care. Many of them are drought-resistant, cold-resistant and longer classic fruit large-fruited varieties. The market today lot of new everbearing varieties of strawberries. These varieties generally produce fruit for about 7-8 months, starting in may and ending October. Also should prefer beardless varieties. You will be spared from having to trim a mustache that weaken the hive and do not let it bear fruit in full force. The advantages of seed growth method is obvious. You can get exactly what is drawn on the bag, in contrast to the process of acquiring seedlings, especially of the hands. 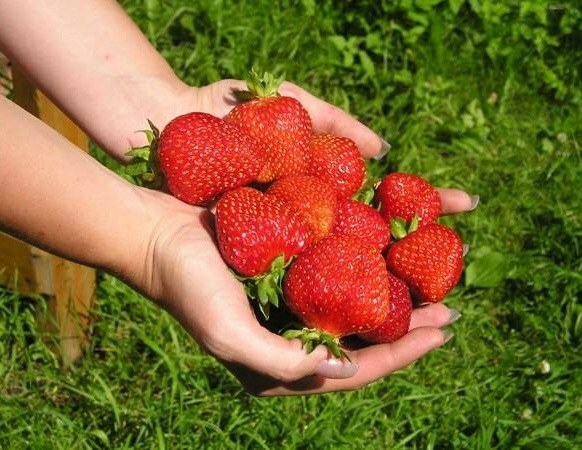 You can also collect the seed yourself from the strawberry varieties that you like in taste. Only when buying berries to ask at the store or from a seller – what kind and where. Preferably, the seeds are not "overseas" berries grown in the region. Strawberry seeds are stored for a long time. So to prepare them, you can summer season, and to plant in February. When preparing your own select the ripest berries. To wash them is not necessary. Remove with a razor or sharp knife the top layer of the skin together with seeds from the bottom of the berries and place on paper to dry. When they dry, RUB in palms, removing the remains of the pulp, and keep before landing in a tightly closed glass jar.